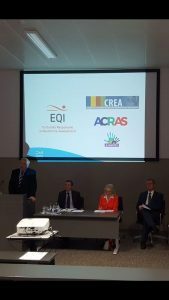 EQI, the research centre of the Dublin City University partner of the E-EVALINTO project held a Keynote Lecture a couple of weeks ago which was given by the Chief Inspector of the Department of Education and Skills, Dr. Harold Hislop. The lecture provided a comprehensive overview of the development, current realities and future challenges facing school inspection and evaluation in Ireland. The E-EVALINTO project was mentioned as one of the European projects that EQI is engaged in. The audience were a variety of leading figures in the Irish education system.